A secret from her past plagues a young woman’s trip to Hong Kong when a vengeful ghost begins haunting her family and friends. Los Angeles – August 4, 2013 – Young doctor Alex Johnston buys his girlfriend Sarah Chang a video camera to celebrate their anniversary. Sarah begins regularly recording with the camera. Sarah is suddenly summoned to Hong Kong when her grandmother falls ill. Sarah’s grandmother is superstitious because it is Gui Yue, or “Ghost Month,” the seventh month of the lunar calendar when spirits can come from the underworld to interact with the living. Grandmother is eventually released from the hospital and Sarah moves into her house to help care for her. Sarah starts hanging out with her former high school friends LeeAnne Chow, Michael Lee, Rachel Zed, and Rachel’s journalist cousin Grace Rau. Meanwhile, minor instances of paranormal activity begin plaguing Sarah in her grandmother’s home. Sarah records a video tour of Hong Kong to send to Alex. The ghost of a dark-haired boy briefly appears in the background. After Skyping with Alex, a weird glitch makes Sarah’s laptop play footage of a high school recital that unsettles her. At a boat party with her friends, the same song is heard. LeeAnne’s phone also receives a strange virus through a distorted QR code. A conversation recalls Stephen Lam, a fellow classmate who stalked Sarah in high school until he was driven to suicide. Sarah is frightened by a bowl of writhing maggots while browsing in a paper store. After a large centipede is seen crawling in her room, Sarah wakes the following morning to find her hair stuck to her pillow by black goo. Odd events continue, including a brief flash of Stephen’s ghost swallowing a centipede and Sarah’s grandmother entering a trance. The five friends visit a temple. Afterward, the girls go shopping where a shadow hand pulls back a dressing room curtain while Sarah changes clothes behind it. Stephen’s ghost briefly appears inside Sarah’s bedroom as a video glitch. Grandmother goes into another trance while cutting paper figures to be used as ceremonial offerings. While at a shop obtaining ingredients for grandmother’s herbal remedy, Sarah and Michael see a jar containing a scorpion fighting a centipede. Michael briefly explains gu, a poison created through Chinese black magic where venomous creatures kill each other until one powerful poison is created. Grandmother vomits a black substance. A video glitch shows Stephen stepping onto a chair in preparation for suicide. Later, when Rachel puts the camera in her lap while at a restaurant table with Sarah, Stephen’s hand is seen reaching toward Sarah’s leg. The five friends go out drinking. When Sarah returns home to sleep, two candle flames are seen extinguishing and lighting on their own. That night, Stephen is seen creeping over Sarah and another video glitch shows his suicide by hanging. While attending a ghost month ritual on a beach, a burning ember flutters oddly above Sarah’s head. A falling neon street sign then nearly misses the five friends as everyone poses for a picture. Sarah starts concluding that the seemingly supernatural events are somehow related to Stephen Lam. Grace accompanies Sarah to Stephen’s grave. Stephen’s mother also arrives, and has a conversation with Sarah in which she says Stephen’s spirit visited her to say he did not blame Sarah for what happened. Grace’s phone camera starts glitching while recording the encounter. Later, Grace is paranormally attacked and killed while recording a video message on her computer. Sarah breaks into the now abandoned Lockwood Academy where everyone went to high school. In the auditorium where Stephen died, Sarah records a confessional for Alex. Sarah explains that she and Stephen had been best friends since they were eight years old. However, she returned from summer camp with new friends and Stephen became aggressive and obsessed, secretly recording videos of Sarah. When his stalking was publicly exposed, Stephen recorded his suicide and uploaded the footage to school computers for everyone to see. Stephen’s death was the reason Sarah left Hong Kong. Paranormal activity suddenly erupts in the auditorium. Sarah flees the building. Sarah returns home to find more paper offerings scattered throughout the house. Grandmother enters another trance and attacks Sarah. Sarah, LeeAnne, and Rachel visit a psychic to try contacting Stephen. During their session, the medium suggests Sarah needs to perform minghun, a ghost marriage, to appease Stephen. The medium briefly becomes possessed. The four remaining friends go drinking at Play nightclub in Lan Kwai Fong. Everyone receives an old Peeping Tom video on their phones showing Stephen masturbating while spying on Sarah. Sarah blows up at LeeAnne for the video, accusing her of shaming and bullying Stephen by publicizing the embarrassing footage. After Sarah storms away in anger, Michael is supernaturally mutilated while Rachel is paranormally pulled into the air. LeeAnne tries to flee, but becomes trapped by a closed gate. Stephen’s spirit kills her. Sarah goes home and sends a desperate video message to Alex, whom she has been unable to contact because of his demanding job, imploring him to come to Hong Kong. The Peeping Tom video suddenly plays on Sarah’s laptop. Grandmother has Sarah burn paper dolls as an offering. Sarah finds videos of her friends’ apparent deaths on her phone before vomiting a black substance. Alex arrives the next day. Sarah nearly drowns when Stephen’s ghost drags her under black bathwater. A monk brings Sarah, Alex, and Grandmother to see Stephen’s mother. It is revealed that Stephen filmed his death in order to capture his soul. Stephen’s mother tries preventing everyone from entering Stephen’s former bedroom, but inside they find an obsessive shrine devoted to Sarah. It is further revealed that Stephen used gu and black magic to turn himself into a demon. Grandmother is supernaturally thrown against a wall and dies. Several monks bring Sarah and Alex to the Lockwood auditorium to perform a ghost wedding, believing the ceremony may settle Stephen’s spirit. Instead, the ritual draws out Stephen’s vengeful ghost, which kills Alex and the monks. The dead monks disappear and Sarah cradles Alex’s body. Sarah and Alex also disappear. Sarah is then seen hanging from a noose in her ceremonial robe, holding hands with Stephen’s hanged corpse as they both sway from the school ceiling. At the theater or at home, cellphones have turned the movie-watching experience into a distracting battleground of rings, dings, and buzzes vying for our attention with texts, tweets, and talking. It was only a matter of time before some enterprising multimedia producers took an “if you can’t beat ‘em, join ‘em” attitude toward integrating entertainment with our easily accessible digital obsession. 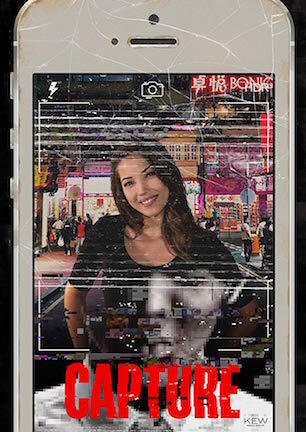 So filmmaker Georgia Lee and Robert Kirkman’s Skybound Entertainment combined to create “Capture,” a “found footage” horror movie where your phone adds an interactive layer to the experience. Unfortunately, the project is late to the party on both fronts of first-person frights and second-screen technology. “Capture” comes at a time when “found footage” couldn’t be colder, while Dutch thriller “App” (review here) already trail-blazed the companion app concept with more effective success. This condemns “Capture” to an awkward purgatory where it flounders as a horror film and as an innovative idea. Story-wise, “Capture” is conceptually akin to a “found footage” take on the “The Ring,” with Chinese ghost mythology supplanting the Japanese fiction of that franchise. Sarah Chang receives a video camera from her beau Alex just in time to be called back to Hong Kong, where her grandmother has fallen ill. Grandmother is superstitious since it happens to be Gui Yue, or “ghost month,” when spirits are able to exit the underworld and interact with the living. Luckily, Sarah has her new camera on hand to capture all the paranormal paranoia on video while nursing grandmother back to health. Sarah also uses the trip to rendezvous with four former friends left behind when she moved to the States. Their cliquey quintet picks up where they left off in high school, alternating outings between drunken partying and soaking up sights of Chinese culture. Hanging over everything however, is a shameful secret in everyone’s shared past. No longer part of their group is Stephen Lam. That’s because Stephen killed himself after his unhealthy obsession with Sarah was publicly exposed. Some of Sarah’s friends feel more guilt than others regarding events leading to Stephen’s death. Stephen’s supernatural spirit still has them all in his sights, as his haunting bleeds into phones, computers, and any available electronics that might aid him in exacting revenge. One scene sees Sarah’s friend momentarily placing the camera in her lap while the two ladies talk at a table. Dead center on the screen, Stephen’s ghost hand moves toward Sarah’s leg before the friend picks up the camera again. Is it just incredibly serendipitous that this moment was caught exactly on cue, or is the ghost intentionally showing off for the camera? Neither scenario is believable. Feelings of forced staging extend to overly rehearsed acting. Stone stiff character interactions play like a line-reciting workshop where none of the dialogue sounds natural. Behavior is also baffling. The twentysomethings’ insistence on partying in a bar, partying on a boat, and partying in another bar is obnoxious enough. Added ridiculousness comes from watching a perpetual plague of supernatural shenanigans befall the group, yet they still call timeout to put on short dresses and go clubbing as if they are on an ordinary Spring Break. Most of the ancillary characters are unnecessary. Jealousy seeds are planted involving Sarah’s boyfriend as well as her old pal Michael, though neither ever sprouts a subplot. The deeper downside to having too many people and not enough development is Stephen never evolves into the intriguing threat he needs to be. Think of how central Sadako’s origin was to the plot of “Ringu.” Her complex tragedy drove conflict and layered the story, creating a memorable horror icon in the process. In contrast, we don’t learn nearly enough about Stephen aside from his infatuation with Sarah and the embarrassment that put a noose around his neck. Stephen ends up a generic, chalk-faced specter with black hair whose backstory is interchangeable in its impact on current events. Saving “Capture” from fully submerging under dull filler scenes is its fascinating tour of Chinese culture’s darker side. The film’s most compelling components involve its exploration of ancient customs, beliefs, and bits including seldom seen concepts of ghost grooms, ghost marriages, and black magic poisons created from venomous creatures. The travelogue may not be particularly terrifying, but it is consistently interesting for an uninitiated outsider swayed by exotic sights and sounds. I’ve made it this far without touching on the film’s phone app component because frankly, the second screen events are so incidental as to be immaterial to anything happening onscreen. Previously mentioned Dutch thriller “App” involved sentient software haunting users through cellphones. That film delivered a parallel experience with the characters through the phone, integrating new camera angles, information, or text messages that added creative material to the movie. To be fair, my screening of “Capture” at the Overlook Film Festival was the first, and there is work to be done before it screens again. However, producers revealed that although the social media layer was planned from the start, nothing was created until the finished film was in the can. This explains why the brief clips that appear on your phone aren’t new, but repurposed footage already existing in the film. There isn’t any benefit to looking at your hand to see a cropped, pixilated rehash of something previously witnessed on the bigger screen. It’s an afterthought experience doing more to distract than it does to enhance. Take out the second screen novelty, which isn’t strong to begin with, and “Capture” is largely forgettable as “found footage.” I want to appreciate the attempt at innovation, but the end product won’t allow it. However, I’m still willing to split the review score down the center to acknowledge effort, and to afford benefit of the doubt that improvements are forthcoming. The “Capture” crew has its imagination on the right track. They are merely riding in the wrong direction. Their next destination should be a return to the drawing board. There they can draft a fresher map of how a film and a phone can truly work in tandem before pulling out of the station again. June 1, 2017 by Ian Sedensky.